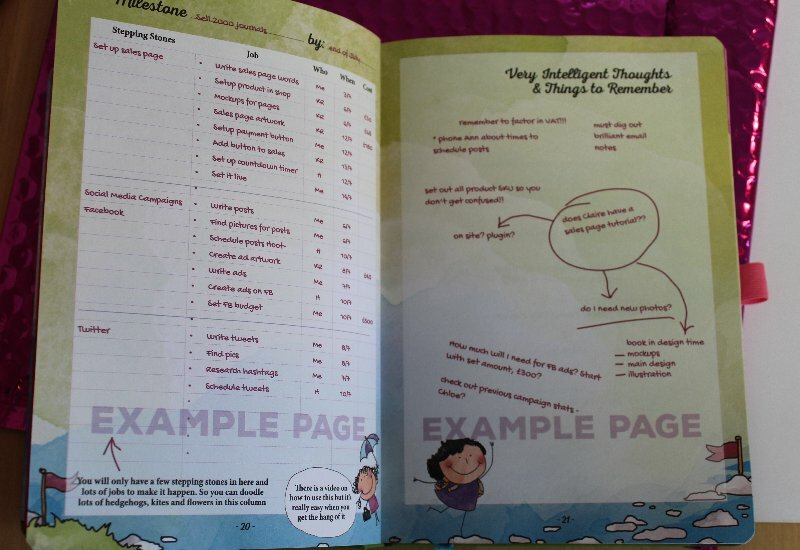 In today’s post I want to introduce you to the Awesome Goals Journal System – created by marketing specialist and owner of “The Girls Mean Business”, Claire Mitchell. I bought this journal recently, because like most of us I have tons of goals in my head, but rarely get around planning them out and achieving them. 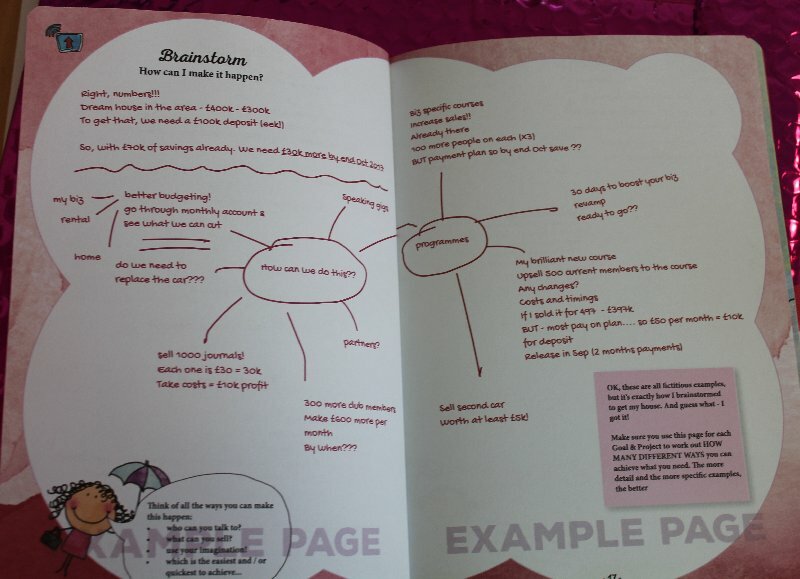 This journal follows Claire’s tried and tested system, which helped her to buy her dream house in the country side. 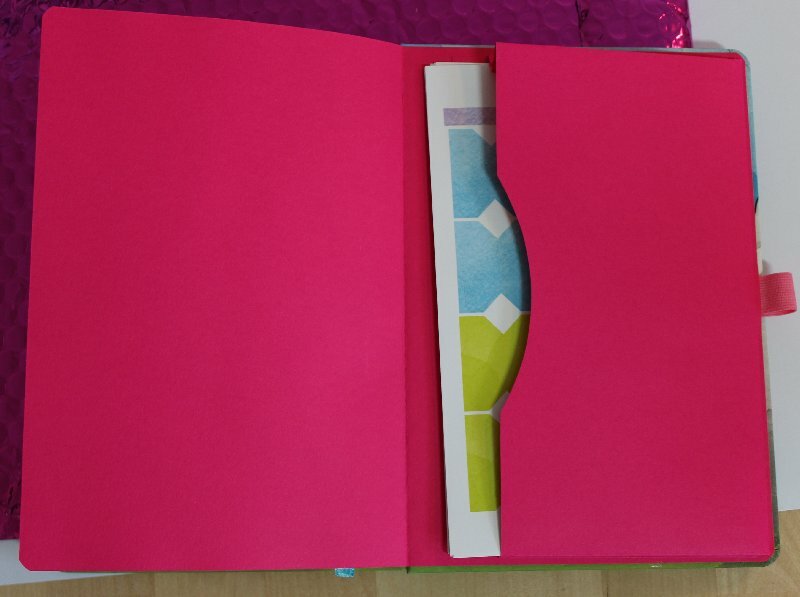 With this pretty designed A5 planner you don’t just get a journal which breaks down your goals in manageable steps and plenty of space to write in, but also a magic pencil, lots of stickers, access to a portal where you can watch how-to videos and download other useful extra planner sheets. 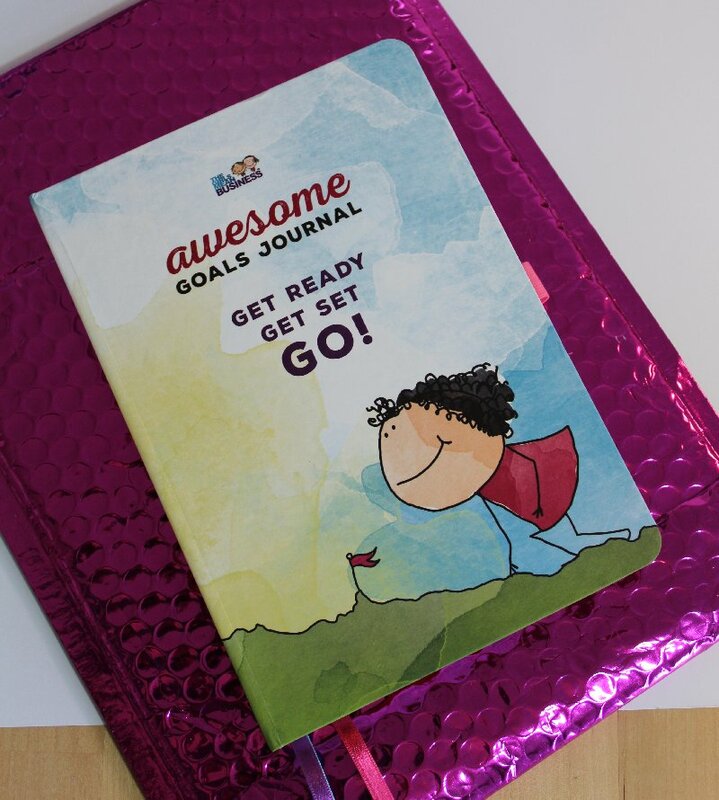 You also get access to the closed Awesome Goals Journal Facebook group where you can share your goals, celebrate your achievements and ask other women for help, when you’re stuck. Back of journal with pocket for stickers. 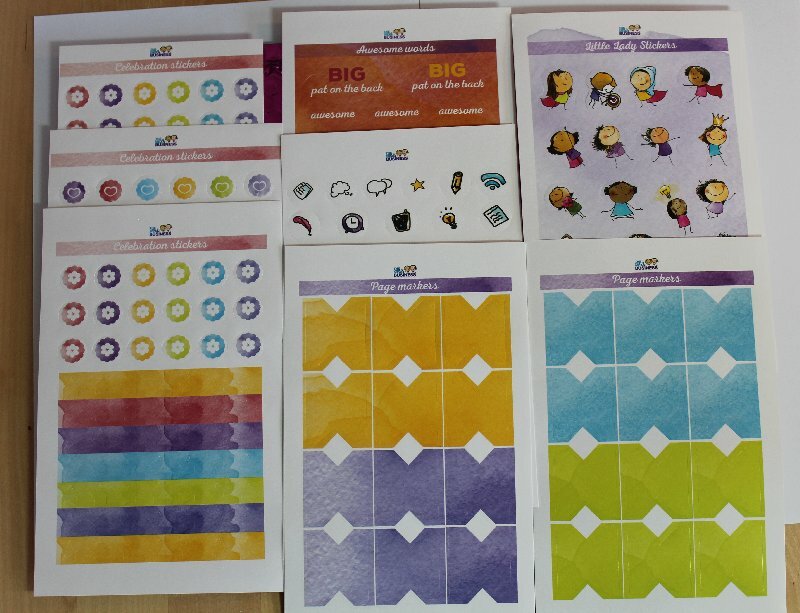 Lots of useful and fun stickers to decorate your journal with and celebrate your milestones. The journal comes with three bookmark ribbons. The 10 step goal achievement map. So you get a lot of thinking, planning and writing space for your goals. It also has a pocket in the back for stickers and other stuff and three bookmarking ribbons – handy when you have more than one goal on the go. Celebrate your achievements in this section. 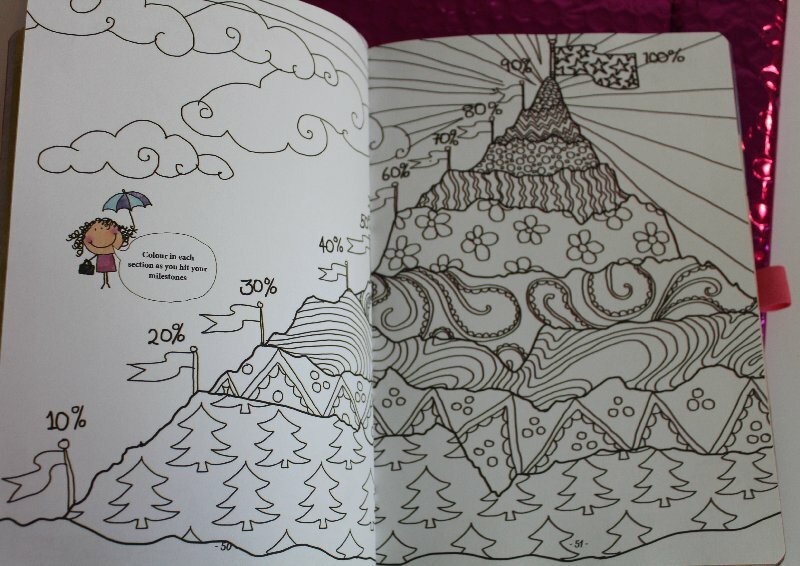 Colour in this mountain to mark your progress. 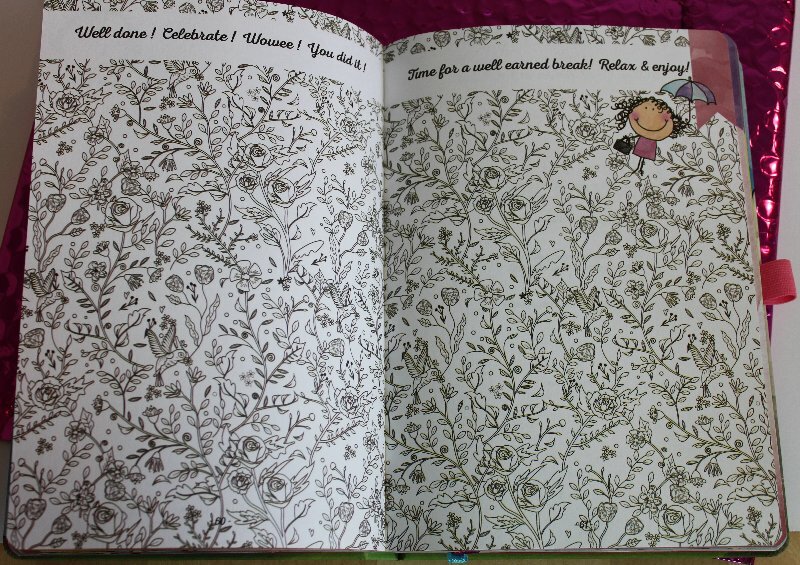 Have a relaxing break with this colouring in section. 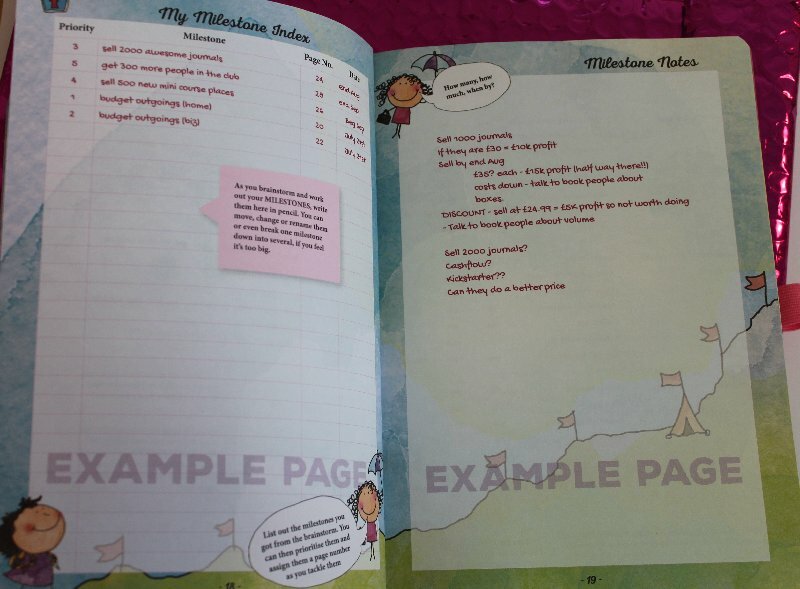 The Awesome Goals Journal System also gives you access to the portal where Claire shows you how to use it. You can also find useful pdf sheets such as a sales tracker, a daily habit tracker, a gratitude sheet, stock trackers and other useful sheets you can download and print out. The portal also includes productivity training videos and challenges. Claire also sends out regular e-mails to kick your bum and stay on track. As an awesome goal getter you also will have the opportunity to earn awesome stars you can redeem. 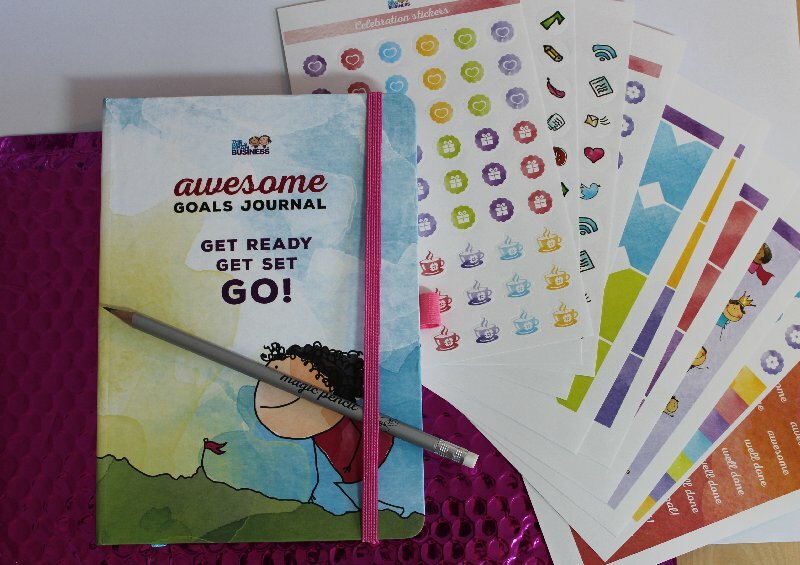 You can use the stickers to celebrate your achievements and some are also meant as bookmarks for your bundles. 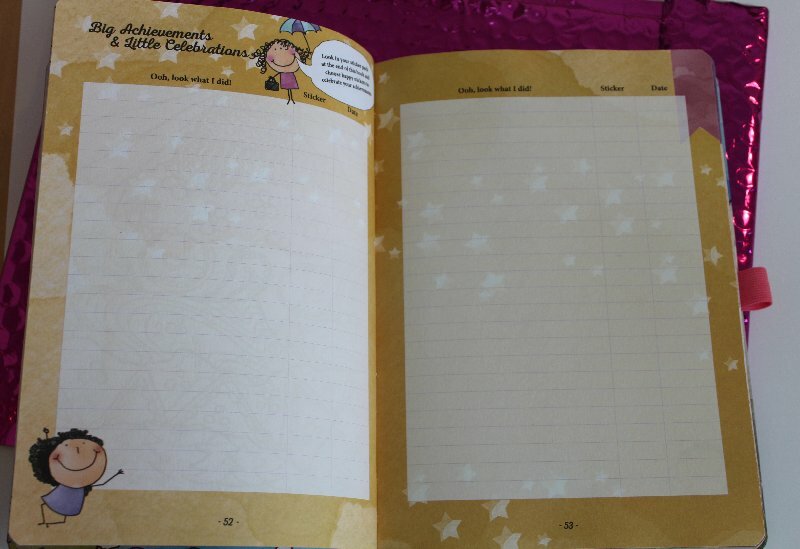 The awesome goal journal portal. Portal with how to videos. 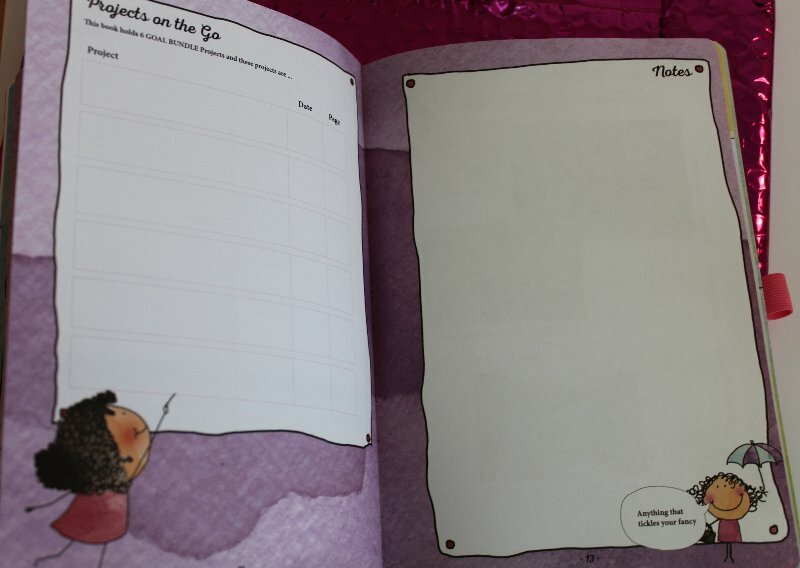 In the portal you can also find useful printables. Why am I recommending this journal to you? Because Claire knows her stuff. 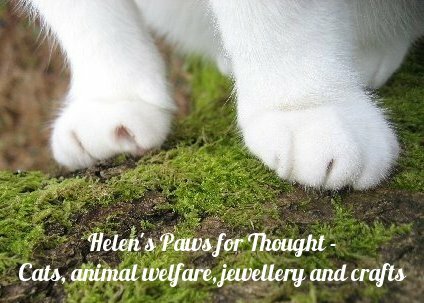 She teaches marketing for small businesses in an easy to understand manner, doesn’t waffle and goes straight to the point. She runs a very successful business that she started from scratch. Claire answers your questions and is genuinely interested in her clients. And I have bought several of her products. Where else can you get membership to a business group with a hard back planner and lots of extras for only £34.95 plus p&p? 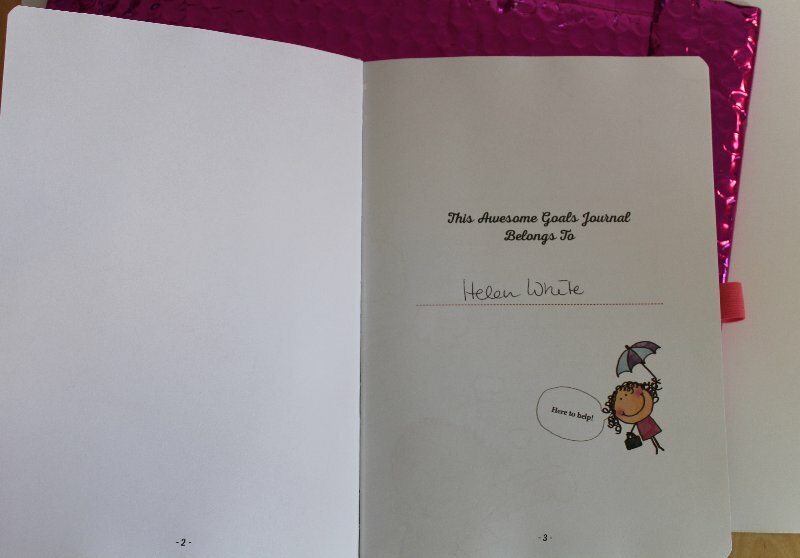 If you are interested in finding out more about the Awesome Goals Journal System please follow my Affiliate link here.